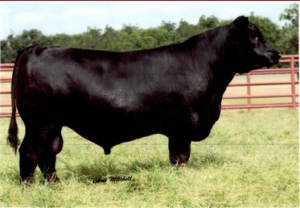 Selected as the 6th high selling bull of the 2014 Fall Sale at 44 Farms, Big Country 3044 is a tremendous combination sire produced by the $260,000 valued Ruby 7130 a highlight of the 44 Farms donor battery. He is sired by the Genex and 44 Farms herd sire EF Authentic 0829. 3044 ranks in the Top 5% for YW, Marb, RE and $W, Top 10% for WW and $B. 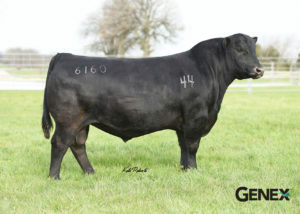 Selected as the $75,000 sale feature of the 2017 Fall Sale at 44 Farms, Common Sense 6160 is a low-birth and MB sire prospect combining the featured 44 Farms herd sire battery members Index 3282 and War Party with the foundation 44 Farms member of the Eisa Erica family, Erica 036y.